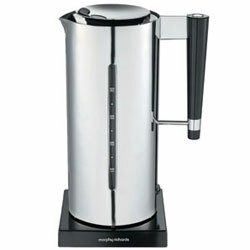 I’m guessing someone at Morphy Richards had an old Bauhaus catalogue open when they designed the Manhattan kettle. It’s very much the modernist design, oozing 30s cool with those straight lines, shiny chrome and non-nonsense looks. In terms of features, it has twin viewing windows, a cool touch handle, removable limescale filter and a 3.1kw element for speedy boiling. But the looks alone should sell this. It retails for £55.